These old manual focus lenses have some strange markings on them. I agree with Jean-Rene. I sure miss the ability to use hyperfocal focusing to increase DoF at a lower f stop. I have a file cabinet full of old Nikon fixed focus (prime) lenses. Vote. I regret these old signs on the new autofocus lenses ! The black aperture scale indicated the depth of field and especially the hyperfocal one! That was lost! 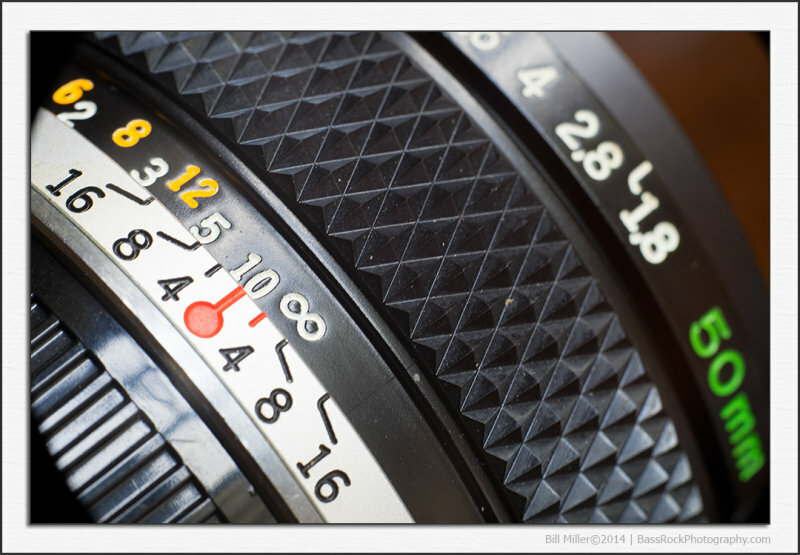 It seems me to recognize a Canon FD 50mm f 1.8 . That looks like the Olympus lens from my old OM10. And I used to know what the markings mean. Super closeup of your excellent bargain lens.